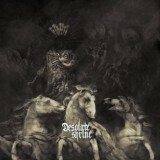 I hadn't previously heard of Finnish trio Desolate Shrine, who have released a string of albums since 2010 with artwork just as stunning as that above, but I'm glad my attention fell across The Heart of the Netherworld, their third full-length, as this is terrific stuff. Deep, dark and heavy, with a powerfully full sound and an approach to death metal that focuses almost completely on atmosphere, Desolate Shrine are well worthy of your time. A cavernous, reverb-heavy sound that's like if Triptykon were buried in a graveyard for a few years and resuscitated with aid of black metal magic, The Heart of the Netherworld is a heady experience that takes its time – three songs here are over ten minutes long, and even the intro is an unusual four minutes. The effect can sometimes be wearying, like listening to a band playing several feet away from you in a heavy blizzard, but Desolate Shrine are much more accessible than the likes of Teitanblood, with the discernible riffs and clear drumwork helping to root the music. The aforementioned Intro is ominous, an ambient throb that fills the air and soon turns to black metal, a shapeless, twisted riff morass atop hellish blasting. Black Fires of God turns this rage physical, a yowling vocal added as the riffs and blasting turn more towards death than black. An epic and evil atmosphere is immediately apparent, some weirdly clean backing singing adding to the strangeness as the death metal aspects of the track take over. This is a seven-minute-plus track that feels like it, using the length to eke out the atmospheric effect and allow the song to change slowly and agonisingly, each second of blasting feeling as heavy as it should. What appeals most is the atmospheric value, as mentioned, but the basic songcraft itself is on point. The following Desolate Shrine opens slowly, tribal drums soon swallowed by an explosion of blackened rage that turns doomy as the track continues – the moments of blasting rage are as miserable in feel as the quieter, more introspective moments. If there's a real fault to the album, however, it's just that it's too much – the album has shown you its tricks by the halfway point, and over an hour of this is excessive. Still, if you enjoy what you hear, then the band will continue to please, and the brittle power of Death is a highlight. Thereafter, Desolate Shrine grow a little too self-pleased for my taste with the fourteen-minute-plus long We Dawn Anew opening with eerie piano and extensive doom crawl before finally kicking into black metal gear – there's no denying that it's effective, but it would have been equally so in half the time. It's barely worth mentioning the final two tracks on the album, Leviathan and the twelve-minute title track, as much the same criticisms could be made of them – too long, repeating much the same tricks as every other track on the album. Each track taken alone, however, is effective and powerful, with the acoustic guitar on the final track a nice touch that plays the album out well. Ultimately, this isn't something that will appeal to everyone, but fans of atmospheric black/death will enjoy this a great deal – even if they don't listen to the whole album in one sitting.